We are rapidly approaching the point of "peak debt" globally. This has been referred to here on this site as the end of the debt super cycle, which began over 70 years ago. The end of the debt super cycle means that many of the developed economies that have used debt to create growth will no longer have the ability to service their current debt or take on additional leverage. The debt of a country can be seen at the individual (consumer), corporate, banking, and government level. 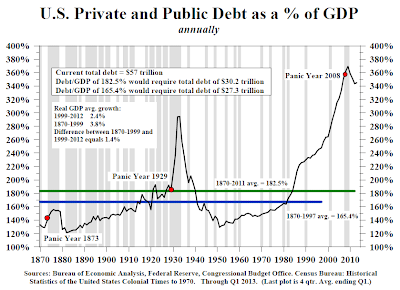 In the United States the total debt in relation to the size of the overall economy (debt to GDP ratio) reached 370% in 2008 before it peaked. 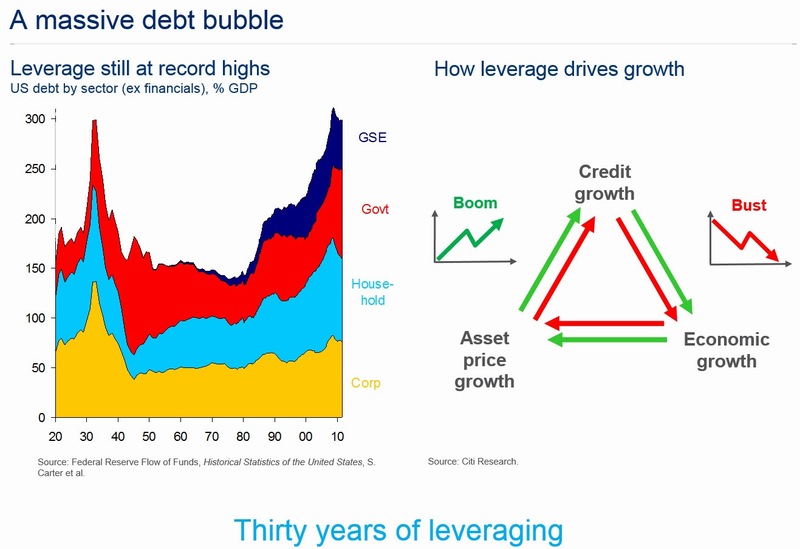 This chart is certainly troublesome as it shows how far the United States still has remaining in the deleveraging process to bring the debt back to healthy/manageable levels. A reduction of just 20 basis points on this 370% debt to GDP ratio has put the country into a depression, temporarily masked by government spending and quantitative easing . 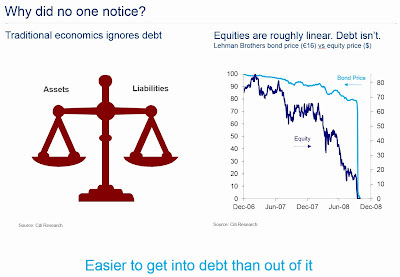 Imagine what would occur if real a deleveraging took place? Here is the chart again with banking (financial) debt removed, showing the three remaining categories (GSE's are Fannie Mae, Freddie Mac, and Sallie Mae which can be considered part of government debt). Click for larger image. Now for the scary part. The United States balance sheet looks like a time bomb waiting to explode (and it will), but viewed against the rest of the world the U.S. is not even the worst offender. The following shows that the balance sheet for Japan, the U.K. and the Eurozone is far worse than the United States. 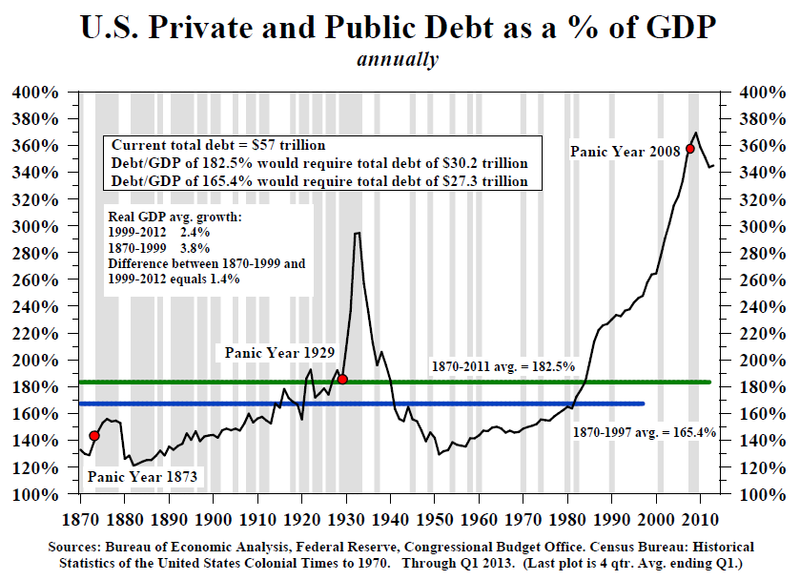 Does this make the United States debt situation more attractive? Of course not. It only shows that the current debt super cycle is a global phenomenon. 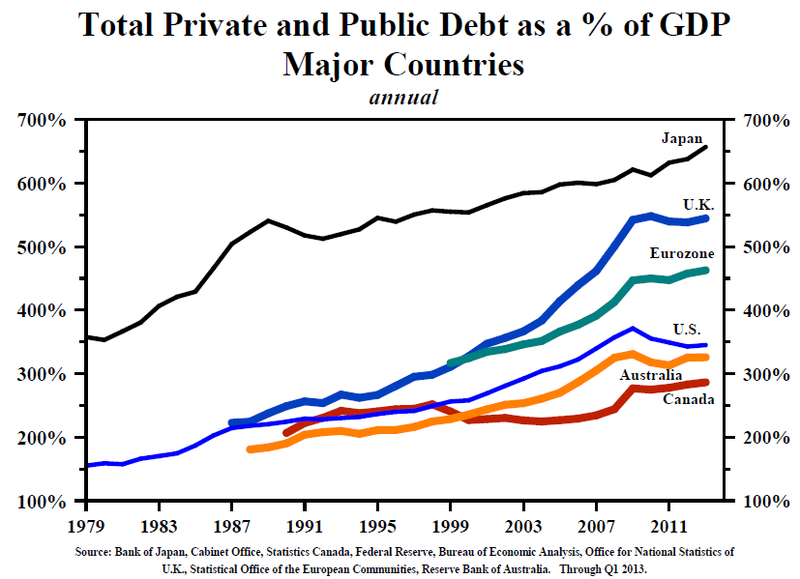 Each one of these four developed regions (which make up the lion's share of global GDP) are approaching the point where they will have hit "peak debt," as the private portion of the U.S. balance sheet did in 2008. The first question is always, with such staggering debt levels why has this not occurred already? This same question was posed for those who argued that the real estate market was in danger back in 2004 and 2005 as there appeared to be no issues on the surface. The answer is that these countries have had the ability to roll existing debt (similar to refinancing a home) and borrow new debt (another buyer purchasing a home at a greater price) at ultra low interest rates. Just as the housing market reached its maximum point of leverage when interest rates rose, the same will occur on a much larger scale for the entire debt market across the developed world. The next question is; Central banks are holding interest rates down with their QE programs in the United States, Europe, Japan, and the U.K. With the ability to print an endless amount of money, can't they just keep rates down forever? The answer is no. Ultimately the market is going to overpower the central banks. This can occur in multiple ways. One way would be for investors to simply get nervous (or understand) that the debt they are holding fundamentally has no value as it is impossible for these debtors to ever repay. We could wake up any day to a very sharp sell off in the bond market for one of the bankrupt developed nations. 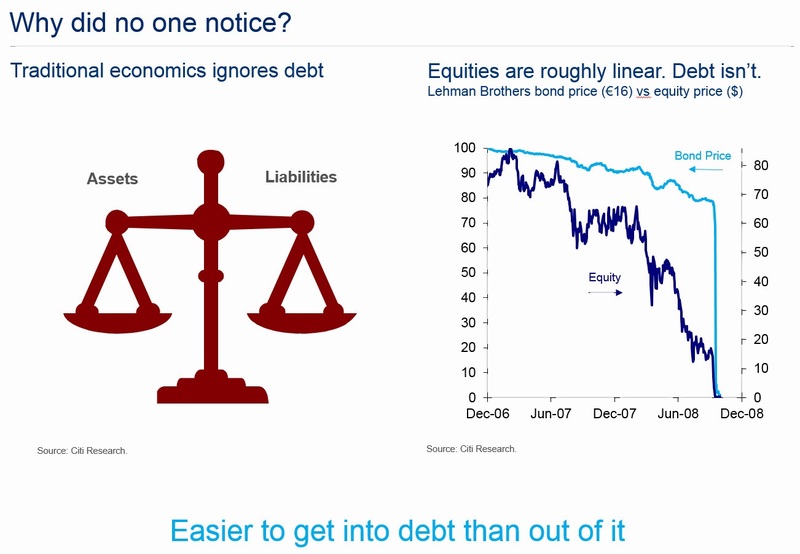 The problem with debt markets, which can be seen in the case of Lehman Brothers below, is that while stocks tend to track down in a linear fashion, bonds are more likely to collapse overnight. Investors believe up to the very last minute that they have most of their value, until they don't. A second scenario could occur if some of the trillions of paper currency currently being printed by central banks globally began to move toward commodities. So far during this QE experiment money has flooded into paper assets globally (specifically the US stock market) and real estate (globally and more recently the United States). Commodities prices have not received the benefit of this freshly printed money. 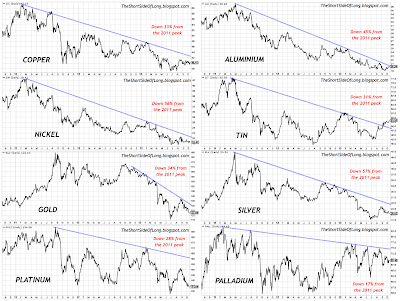 Since 2011, the major commodities have fallen in an almost steady trajectory. They have become the most hated asset class on the planet (considered by many to be in a new secular bear market). 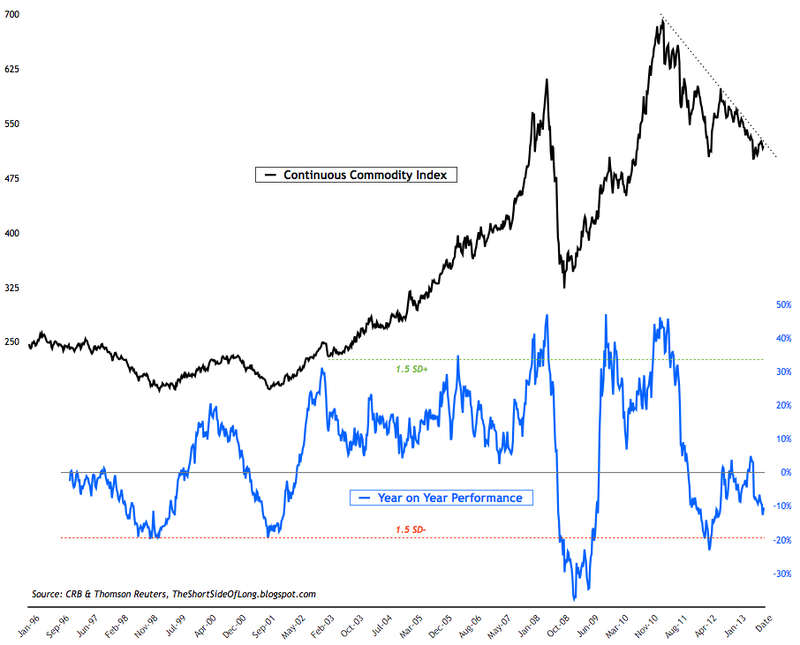 The next chart shows the entire commodities index since the secular bull market began in 2000. There was a cyclical rise into 2011 and a steady and relentless decline since that peak. 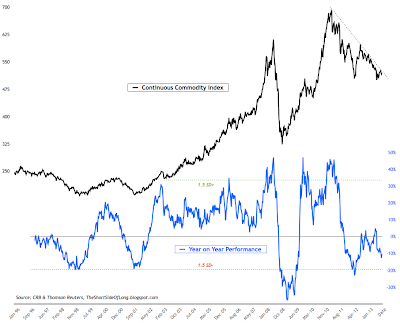 Hedge funds have slowly off loaded their commodity positions and many commodity based funds have even shut their doors over the past few weeks. A secular bull market usually moves through five waves during its completion. 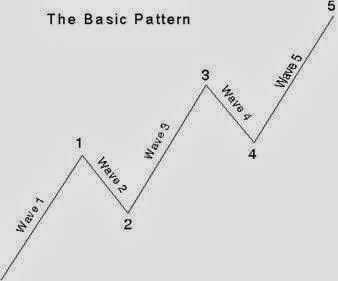 This is called the Elliott Wave cycle. The second and fourth waves of the cycle are correction (downward waves). We experienced wave one up from 2000 to 2008, corrected into early 2009 (wave two), then experienced the second wave up (wave 3) into 2011. We have been in the second corrective wave down (wave 4) since . How low will this wave go before it completes? Based on the chart above it could fall much further. 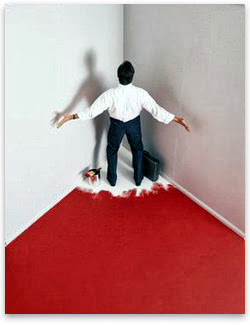 However, as just discussed, pessimism within the sector has reached incredible levels. I like to buy assets that I believe are in secular bull markets when they have declined in price and sentiment is low. This usually causes me to begin buying before a bottom is in place. New money created by the central banks around the world has flooded into paper assets. 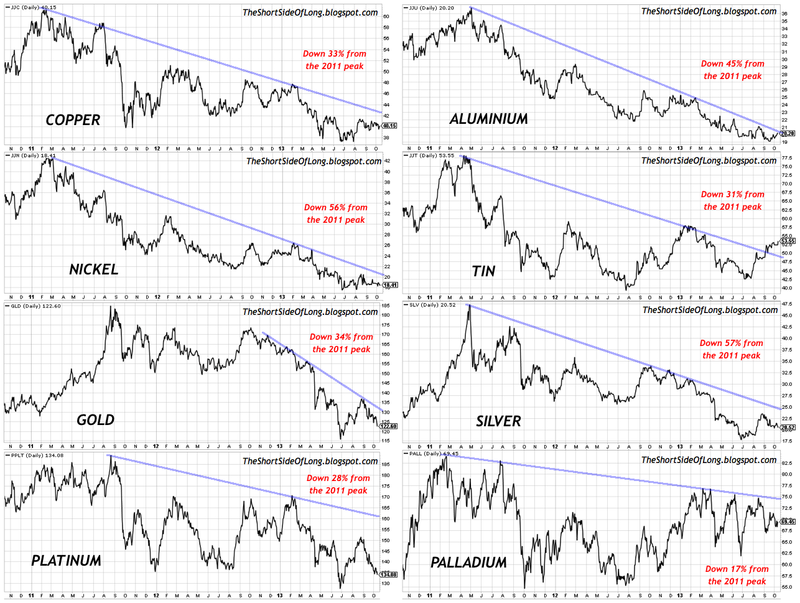 If some of that money were to rotate into commodities it would put the bottom in on the current cyclical move downward. This brings us back to what could potentially slow the QE purchases globally. If commodity prices begin to rise it creates inflation in assets that people use during a day to day basis (unlike the inflation seen in the paper financial markets thus far during the global QE experiment). If real inflation rises (gasoline, food, utilities, health care, or the goods purchased at the store), investors will demand a greater return on their money to compensate for inflation risks. This will cause yields to rise, and it will reveal the true corner that the Federal Reserve and other central banks have painted themselves into. This process will bring about the endgame of the debt super cycle. A new monetary system is put in place about every 40 years and the current one began in 1971. We are overdue for what has occurred naturally throughout history. This will not bring about the end of the world, it will just bring change. Those that understand it is coming will take advantage of the short term chaos and purchase assets at inexpensive prices (the paper and real estate assets currently back at bubble prices). Thanks for your continued, excellent work. It is much appreciated.